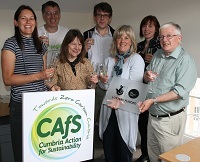 PACT is a partner in the Sustain Eden scheme run by Cumbria Action for Sustainability (CAfS) that is funded by the Big Lottery Fund. Their Communities Living Sustainably fund supports communities in England to live and work in a more sustainable way. The SustainEden project runs from February 2013 for three years. In addition, PACT will receive funding to cover expenses including the monitoring and reporting on specific projects. 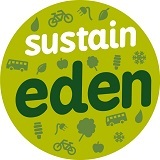 PACT is part of the Sustain Eden steering group. The project partners will coordinate activities and the CAfS project team will support and publicise all the project activities. This school-based project will build on our previous Story Giants of Eden project that ran very successfully in 2010-2011, led by Dawn Hurton. The Cumbrian Archive Service and Dawn Hurton have agreed to support this new initiative. The project will use archive records to look at how industrialisation affected the landscape through its trees. It will identify the uses of wood as a resource during key periods and explore the achievements and follies of mankind along the way. The PACT Food Group will support the grow-your-own food project run by Penrith and Eden District Freegle through Freegle UK. Freegle aims to support the growing of food in Eden District by helping people pass on unwanted seeds, plants, trees and surplus produce to others for free. The Freegle Direct web service will be set up to enable people to join, offer and request items in a garden category. CAfS and the PACT Food Group will help with local publicity such as films and events, and encourage skill-sharing to start alleviating food poverty. Freegle has a target of 500 people exchanging locally grown food stuffs by the end of the project.